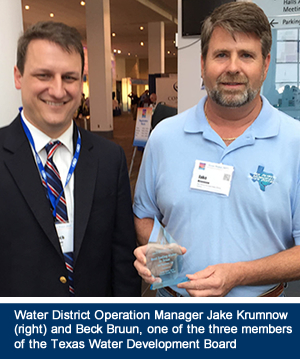 San Patricio Municipal Water District is the second place winner in the 2015 “Best Tasting Water In Texas” competition conducted by the American Water Works Association (AWWA) – Texas Section. The contest is conducted for fun and bragging rights with sponsors encouraging members to use the opportunity to showcase their ingenuity, know-how and skill. The first place winner for 2015 was Universal City on the northeast side of San Antonio. The Texas AWWA includes most of the state’s municipal water utilities. Judges selected winners in a blind taste test during the group’s annual “Texas Water 2015” conference in Corpus Christi. During the conference, the Water District hosted a group of water professionals on a tour of the District’s water treatment facilities located between Gregory and Ingleside. The 2nd Place “Best Tasting Water” entry came from the San Patricio Water District’s sophisticated microfiltration plant and a small plant used to bottle drinking water as part of the district’s ongoing water conservation education program. Jake Krumnow, district operations and maintenance manager, was responsible for developing the bottling plant and for fine tuning it to produce good tasting water. He is also responsible for producing and delivering millions of gallons of water daily from the District’s treatment plants. In 2010, the last time the Water District entered the Texas Water competition, it won first place as the Best Tasting Water in Texas.